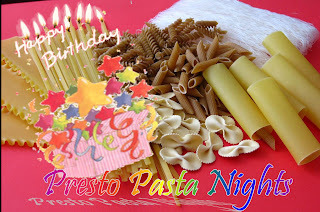 Presto Pasta Nights has come a long way since it first made its appearance back in March, 2007. 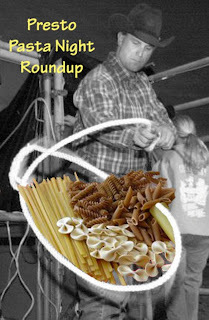 Nowhere else will you find so many fantastic pasta dishes in one place. Breakfast, lunch & dinner; hot & cold; spicy & sweet; appetizers to mains to desserts...check them out. 2008 started out great, with a fun logo and awesome dishes. The name you want to go by, publicly; your blog name; name of the dish. Check here to see who's hosting in the next few weeks. Entries will be posted every Friday, so you'll have some great new recipes for the weekend. Please make sure your entries are in by Thursday evening. Don't worry if you don't have your own blog, you can email your recipe directly to me at ruth@4everykitchen.com and I'll post it for you. 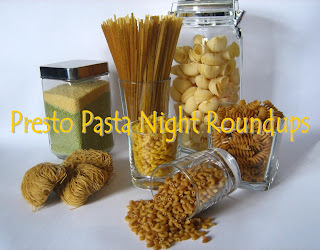 If you're interested, please join the Presto Pasta Night Gang on My Facebook and let's see where the fun takes us all this year! You've got a great blog!!!! I'm adding it to my favourites! I love this idea and wish I wasn't so late in the game. Just submitted something and will continue to do so. Rock on. Ivy great dish...keep them coming! Nuria...thanks and back at 'cha. Pauline...better late than never. Hope to see all of you often. This seafood noodles dish looks so beautiful with the colors, I'm sure it'll be a big hit with the kids! Nice colors! Although I'm to a big fan of seafood noodles dish, this sure looks yummy! I'm normally the one that will say no to seafood noodles dish. OMG! so many different types of cooking pasta... bring more on!